Luxe. Glam. Bold. Juliette is breaks all the rules with a daring blend of rose gold and honeyed gold accentuated by gorgeous red, metallic crimson, and deep scarlet crystals. With the perfect blend of jewels and gold, the Limited Edition Juliette Bracelet was designed to be a statement piece you’ll wear for years to come. A gem of the Lauren’s Hope 2019 Studio Collection, this stylish medical alert incorporates multi-faceted crystals, and mixed metals for an upscale look that’s sure to turn heads. Individually crafted by our master jewelers, Juliette is a Lauren’s Hope Exclusive Studio Collection Style, available for a limited time only. Your Juliette Medical ID Bracelet pairs with any custom-engraved Lauren’s Hope medical ID tag, keeping what’s truly most important to you right at hand. 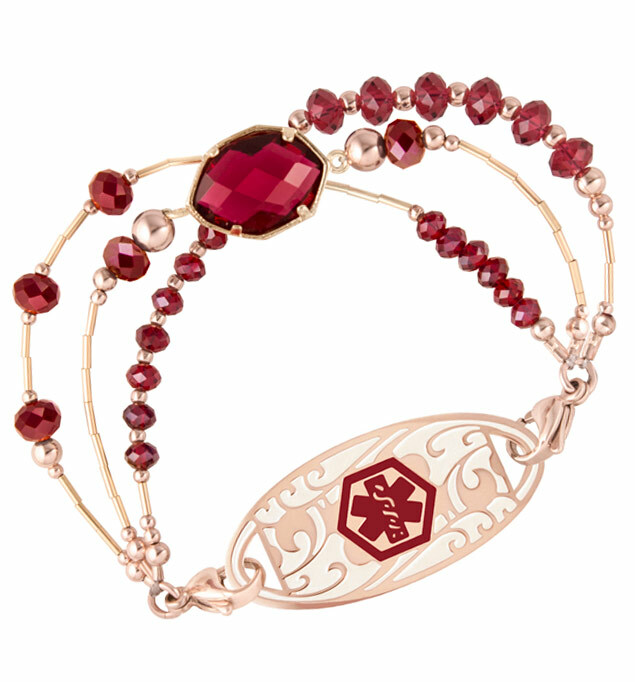 This stylish med ID is an ideal choice whether you or your loved ones wear medical alert bracelets for a history of Type 1 Diabetes, lymphedema, weight loss surgery, celiac disease, food allergies (such as peanut, tree nut, soy, or wheat allergies) or for any other medical condition or treatment consideration. Custom engraving allows you to choose the look you want so you can stay safe in style.